A well-known fact is that the restaurant industry is very competitive. According to the National Restaurant Association, currently, in the USA, there are more than 1 million restaurant locations. This shows how hard it is for a new or an existing business owner to maintain his competitiveness in the long-term. Many entrepreneurs fail in this regard, as Cornell Hospitality Quarterly points out an industry failure rate of 25%. But failures are present in every industry. What is more important is to find out the main reason why restaurants close. The answer is simple – failure to retain existing customers. In order to find the right strategy for retaining existing customers, a business owner should, first of all, find out what the needs of his clients are. The client today is very different from the client a decade ago. Nowadays, you can’t satisfy the guest of your restaurant only with delicious dishes. Clients want to feel delighted, engaged, heard and empowered. This means that business owners should focus on connecting on a whole new level with their clients. In fact, a Harvard Business School research concluded that when there is an emotional connection between restaurants and their visitors, the customer value increases with as much as 27%. Your guests want for you to acknowledge them. To appreciate the fact that they have chosen you and not your competitors. All this means that the only way to become a successful restaurant owner is to put the needs of your clients first and to do whatever you need to ensure their comfort and positive experience. And this is where most business owners fail at. Transforming a client’s visit into an experience requires creativeness and desire to be innovative. Those who are willing to add that personal touch to their service have one sustainable strategy to rely on – it is called “gamification”. The idea of this concept is to engage a given individual or a group of individuals by using game-design elements and principles in non-game contexts. Or in other words – to reward your audience for certain achievements or their loyalty. This whole concept has started from games and due to its power to influence and even obsess, has been transferred to business as well. This is the cornerstone of the whole strategy. Loyalty programs are applied with great success in various types of restaurant businesses. Starbucks, for example, launched the “My Starbucks Rewards Loyalty Program” back in 2010 and currently has more than 13 million members. With the introduction of the loyalty program, Starbucks experienced a 26% rise in profits and 11% in revenue. The program includes digital ordering and payments and it collects funds within the clients’ accounts. Users can load funds in their Starbucks plastic cards use them for payments. That way, clients get better prices and special offers. At this moment, there are more than $2 billion in users accounts. Examples of successful loyalty programs are numerous – from Panera’s 25 million users and more than $1 billion annual sales via mobile, to Subway’s punch cards and Chipotle’s ‘’from 0 to 3.1 million loyalty members” in 3 months. What makes all of these programs successful is the desire to satisfy the needs of their clients. 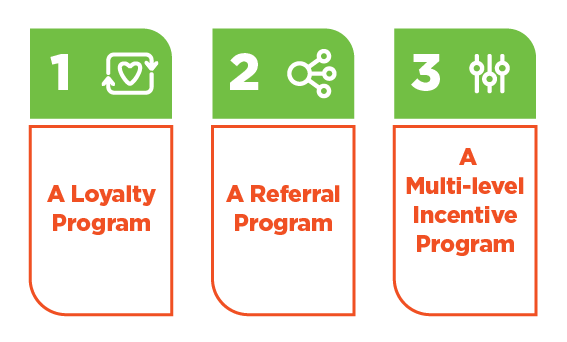 The successful loyalty program is intended to influence two main factors – to increase the customers’ net spend per visit and the frequency of their visits. This can be achieved by tailoring a program that rewards each purchase with a certain amount of loyalty points. A good way to calculate the points is per dollar spent. Create a clear scale with reward requirements and provide dynamic discount rates per purchase in exchange for a certain number of loyalty points. In the first scenario, where you want to influence how much a guest spends in your restaurant, a proven strategy is to offer discounts on sums above certain amounts. For example – if you notice that the bill of a given client is $35, you can offer them to spend an additional $15 to get a reward of 15%. That way, you will make your client spend 30% more by giving him a 15% discount. This is a great example of how to maintain high margins while rewarding your clients. 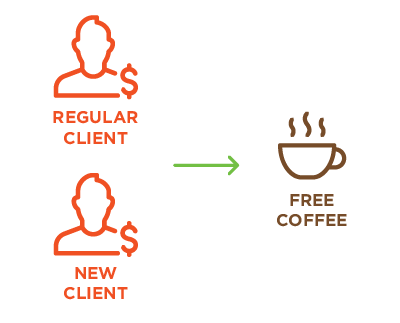 If you want to increase the number of visits a client pays per month, you can offer them a time-related discount. For example –a 20% discount on their bill if they come back within the next week. Make sure to enhance your customer rewarding strategy not only with discounts and loyalty points but with an all-around approach and in-depth engagement. Try to build a whole community. If your restaurant offers its guests delicious food and beverages, great service and an amazing atmosphere, you have the perfect prerequisite to attract them for the long-term. But you should not stop with that. 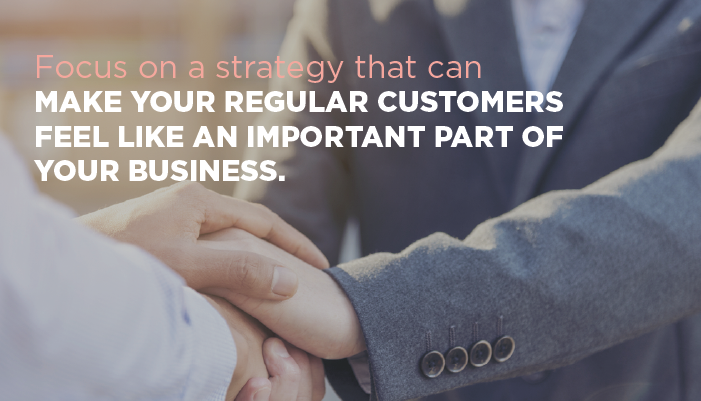 Focus on a strategy that can make your regular customers feel like an important part of your business. That way, they can get a taste of a whole experience, not only a visit. A referral program is a great way to achieve that. Consider your regular visitors as a part of your marketing team, not only as clients. They are, in fact, the best advocates for your business. And by adding a referral program, you are basically rewarding the fact that they share their opinion with friends, colleagues and other potential visitors. Apart from that, a referral program will indirectly affect their willingness to promote your place. It serves as an informal call-to-action element that both sides will benefit from – you will be getting more customers on the expense of a discount to an existing one, while your referrals will be saving money while dining at their favorite place. Bear in mind that your regular visitors are probably doing this word-of-mouth marketing already without realizing it. The main difference is that they are not being rewarded for it. And what better way to increase their affection for your business than rewarding their efforts. This type of gamification element has the power to grow your business exponentially. Just imagine with how much people each of your referrals communicates on a daily basis. And each and every new visitor does the same on a daily basis. This results in a massive communication channel. 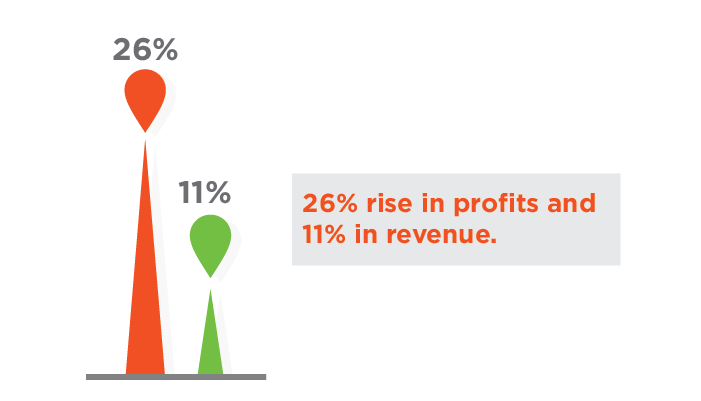 The ”Achieving Big Customer Loyalty in a Small Business World” study points out that existing and returning customers spend 67% more per purchase than new ones. This just confirms the how valuable your regular customers are for your business and the importance of keeping them happy. Clients, who are included in your loyalty program or are official referrals of your business, although basically being a part of your community, may sometimes consider this relationship as a more formal and business-oriented one. In order to avoid that, make sure to show them that you care about their time, experience and satisfaction. A great way to do so is to express your willingness to find out more about them – what they need, like and dislike in your restaurant. For example – promote incentives for those who are willing to share their feedback. Apart from that, such an initiative will help you indirectly affect your marketing strategy by getting some social media shares and increasing your brand awareness. If you own a small business (a quick-service restaurant for example) and want to get a taste of the gamification elements with some easy-to-implement methodology, then the next test strategy is for you. If you are making delicious sandwiches or you are just a small, yet popular place for coffee, start offering each 10th order for free. If you are running your place for a few years already and have regular customers, they will love to get a free coffee or a sandwich every once in a while and will surely appreciate it. On the other hand – when you are just starting or want to increase the number of your new customers, a strategy like this will serve as an extremely positive surprise for your clients. As the famous quote says “There is no free lunch”. Yet, if you make sure that each 10th visitor will get such, you will experience a massive increase in customer satisfaction. Just consider the following – a sandwich or coffee will cost you no more than $10. According to an American Express’ 2017 Customer Service Barometer, Americans tell an average of 11 people about a good service. Can you think of a better marketing strategy with a budget of less than $10? A point-of-sale system is basically the foundation of a well-working restaurant and the most important step when paving the way for a successful restaurant growth strategy. For any kind of rewarding program to be successful, you will require data and customers’ insights, such as what they prefer, how much they spend, on what do they prefer spending, when are the peak hours, etc. By using such type of data, you can build and tailor the perfect strategy. Having a POS system in your restaurant is the perfect way to gather and analyze customers’ data. That way, you can opt to automatically sign your clients for loyalty programs when they use credit cards. Apart from that, it will help you track your loyal customers easily and accurately. With the help of good restaurant software, you will be able to track the frequency of your clients’ visits and reward them for their loyalty. Strategies like this can help you surprise your guests with personalized offers, coupons, and promotions or even a small gift on their birthdays for example. The idea behind all these gamification elements is to make your clients engage with your business and improve their experience, while at the same time increase your profits. But if we take a look from the perspective of your customers and the psychological point of view, the most important thing is not the discount or the reward. It is the thrill of reaching new heights and progressing. Due to our competitive nature, we are prone to constantly chase a goal, until we reach it. And the more rewards we receive on the way, the more satisfied we are. 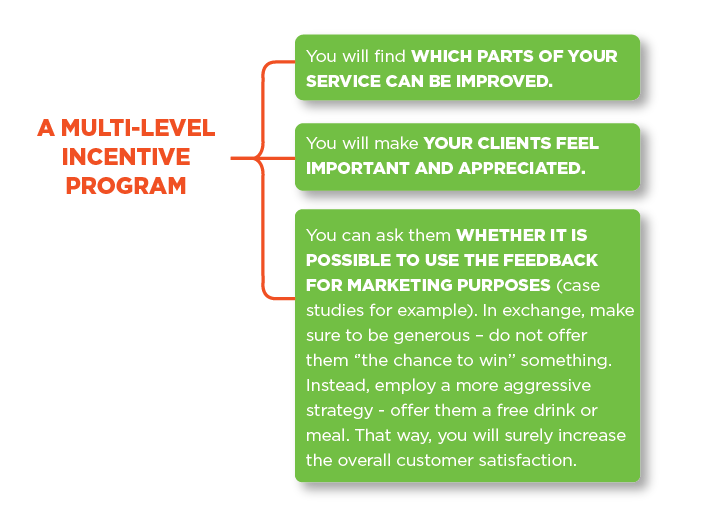 The adoption of a loyalty program provides restaurant owners with huge opportunities to be exploited. And for both parties, basically, it is a win-win situation.